Finished reading The Translated Man by Chris Braak yesterday. Since I’m being regularly e-mailed by a web site who’ve taken to including my posts tagged reviews are included in their review listings where the reviews are in turn reviewed I’m going to do a bit of a Corbett first. While I may tag this as a review it is in fact more of a loose collection of ideas and opinion strung together without any proper, formal review process being undertaken. Nothing that follows is rigorous or properly thought about and in fact its just my opinion in the end. If it were a review (like the ones I wrote for Valkyrie a long time ago) I’d put a lot more effort in even though I know that in the end it is just my opinion and is fairly meaningless after all that. 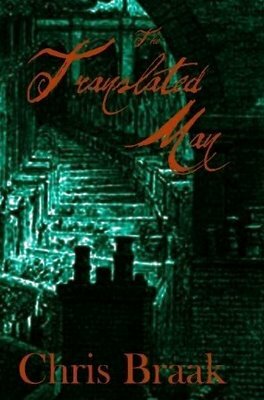 The Translated Man is a novel available from Lulu running just short of 240 pages in length laid out at a size that means two pages comfortably print to a side of A4. That was a good thing as I was enjoying it so much that I printed the whole of it out so I could read it away from my computer. Thats a first for an ebook I’ve bought of this length. It was a real page turner so I had to have pages to turn. The story is an atmospheric police procedural tale that could be said to be steam punk or perhaps victorian fantasy in genre. Its set, mostly, in a city. A city where everything, including the architecture, has been shaped by various power struggles between wealthy families. A city which is struggling under the burden of war and with racial tension waiting to boil over. The main characters work for one of a number of police organisations in the city, the Coroners. Their specific area is hunting down criminals who comitt heresy including such acts as reanimating the dead. Their colourful staff include a hard bitten detective a the young, foppish junior detective, a clairaudient and the only reanimate ever declared not to be a heresy. All the characters are interesting. Even when at first glance they might have been detective genre or fantasy standards are more than two dimensional cliches. The story itself has an excellent plot which twists and turns from its in medias res opening to its dramatic finale. It cuts back and forth amongst the investigators. Even though the setting is fantasy it holds together logically and provides enough information to allow the reader to leap to the right (or wrong) conclusions as the events unfold. It isn’t a perfect work. A bit more proof reading would have picked up the handful of places where typos slip through, robe for rope at a dramatic moment springs to mind because it distracted me at a crucial moment in the plot. A few sections where none of the view point characters are present are described in a slightly awkward tell rather than show kind of way. After a fair amount of thought I wonder if might have been avoided by adding a character of a lowly gendarme from a competing police force who could easily have been on the scene at a couple of points in the story and who could have acted as our eyes. Early on in the story there is also a two page info dump about the city’s architecture which I can’t think of an easy way round. While later in the story dates are given for historical events early on years relative to the main detectives time are give. Not a huge problem but as a reader of detective stories it pulled me out of the story as I started to try and look for clues hidden by the slightly awkward writing when there were none. Those however are my only criticims of the story. I can’t go into a lot of what I enjoyed about it without risking spoiling the story. I did have a small laugh when the characters attend The Bone-Collector’s Daughter given Kim wrote The Bone Magician’s Daughter. As I said already – a real page turner. All in all very good.